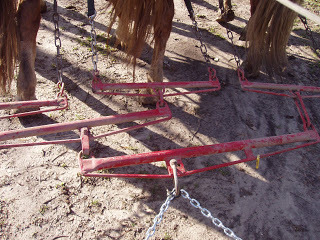 Suffolk Punch Draft Horse on a Bob-sled. Winter, our quiet time, is a time we use to keep our horses tuned up, and ready to work as instructors in our Montana Workhorse Workshops. 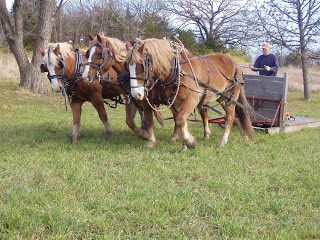 We have had snow here at home since mid-December so we get to put the horses on sleds and sleighs, and in some cases, change out the wheels (for example on the fore cart) for runners. 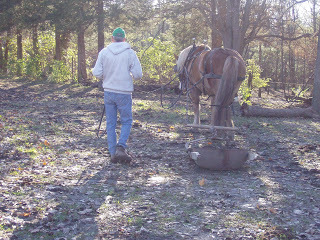 Here, Doc has Ann, one of our Suffolk Punch Draft horse mares, on a small feed sled. 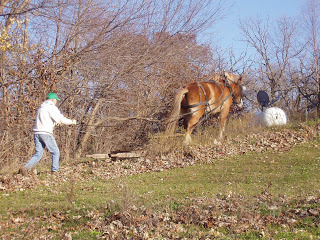 This sled is great with a small load and a single horse. We love all seasons in Montana, and especially enjoy Montana’s long snowy winters. 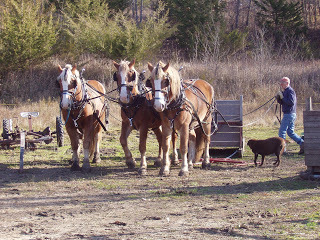 This time of tranquility gives us another set of opportunities (besides the fair weather and ranch work of summer) to enjoy driving and working with our horse partners. 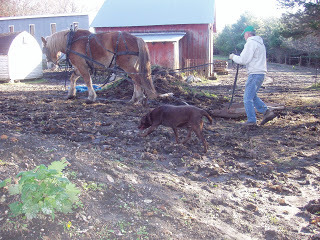 For Doc and me, plowing with horse-drawn walking plows is a favorite activity. 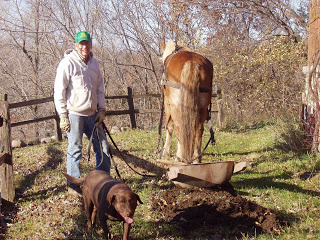 We both enjoy plowing with one, two, or three horses hitched to a walking plow. 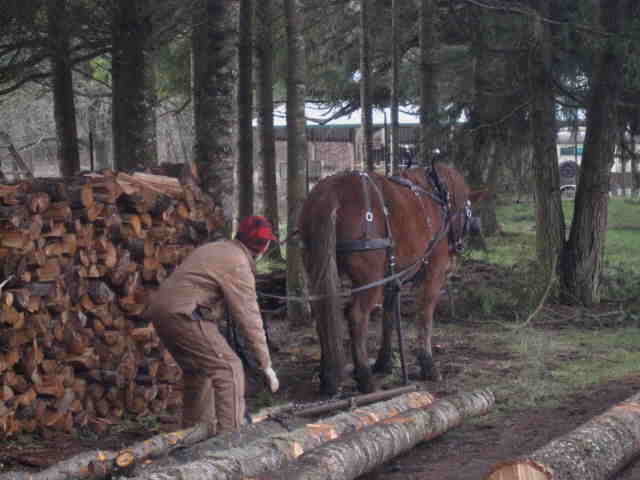 The sounds, the smell, the feeling of holding the handles, and working with the soils … it is all part of it for us, as well as working with the horses as partners to get a job done. 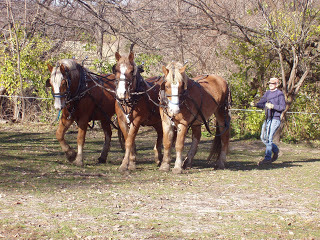 Helping the horses gain skills and understanding of the task and to make their contribution in a relaxed and comfortable way is very important to for us. 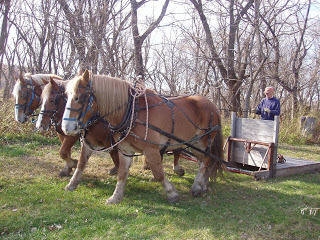 We both share an interest in horse drawn equipment of the past and have somewhat of a “collection”. We are enamored with the details of parts, engineering, design, history of the manufacturers, adjustments, maintenance, and attachments of this old equipment. We both think there is beauty and art in the form and function of many of these older pieces, particularly the walking plows. The “plow hitch plate assembly” is one of those very appealing artistic components of walking plows. This “plow hitch plate assembly” is one from a plow we recently found in eastern Oregon, a Vulcan #14. It has been fun for us to do some research on it, find out about the Vulcan Manufacturing Company, think about getting it in working order, ready for it’s use next spring. We are getting very excited after we received recent news that two ‘new-to-us’ plows are being shipped to us by Tommy Flowers, and will have a new home here in Montana. 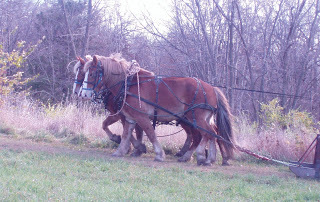 A Chattanooga 43 10″ two-horse walking plow will be perfect for our Fjord Team, and a Lynchburg 6 an 8″ single horse walking plow for our single Suffolk Punch horses should be arriving soon! 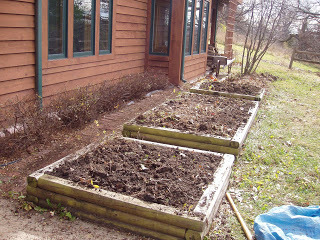 The ground isn’t frozen and there is no snow yet … maybe they will get here it time to try out before winter hits…. Learning to plow is one of the favorite activities for students in our workshops. Doc and I always look forward to sharing our passion for plows and plowing with students in our workshops. 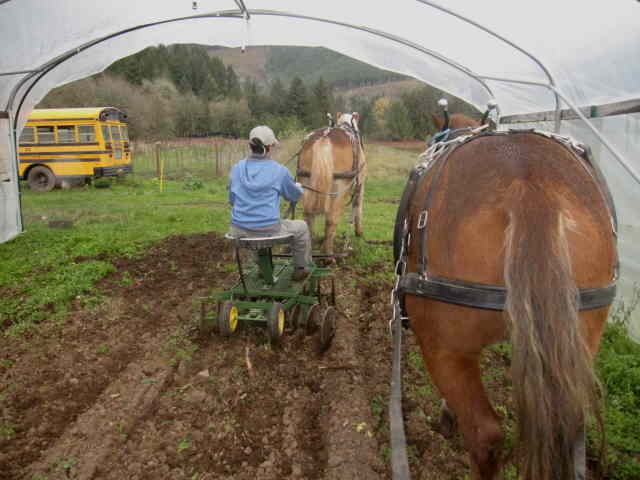 Learning to plow is one of the favorite activities for many students. One of our students, who had waited since his youth to plow with a horse was particularly excited about “taking the handles” for the first time. He said to me this year, “Cathy, I have yet to try this thing that you love so much, but I am ready now.” You should have seen the smile on his face as he looked back after completing his first furrow! Tom Triplett, (Doc’s mentor and step-father) along with his wife Betty, cared for Jay Jay, Cathy’s Welsh pony, for the last 2 years. We all thought he would be a good cart driving partner for Tom. Jay Jay enjoyed life with two standard Donkeys, and being cared for by Tom and Betty. In the winter of 2011, we all agreed that Jay Jay might benefit from living on the wider open spaces at Therriault Creek Ranch with Doc, Cathy, their horses, and mule for a while. Tom knew that if Jay Jay was to live on a ranch, he best be ready to do ranch work. 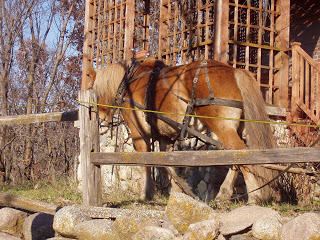 Tom didn’t figure that the light driving harness that Cathy had for Jay Jay was a proper ranch harness. So he made a work harness for Jay Jay. 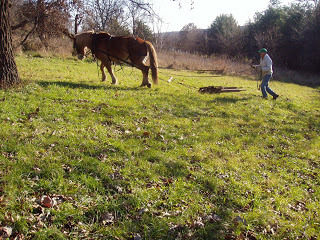 This one is complete with wooden hames that belonged to Tom’s father. June 20, 2011, Father’s Day, Tom fitted the harness to Jay Jay. It is perfect! We are having a very normal Rocky Mountain Spring time this year; We woke three days in a row last week to new snow! 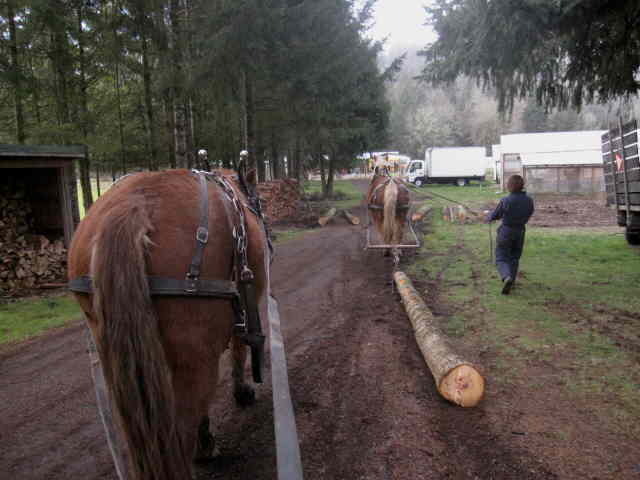 Here is a view we walk past on our way to the barn. 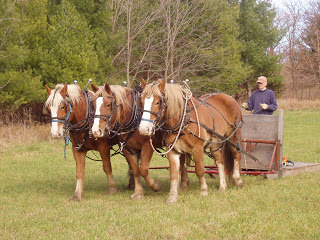 This photo shows Ten Lakes Farm www.tenlakesfarm.com, the organic market garden and CSA, owned and operated by farmers, Todd and Rebecca, on Therriault Creek Ranch. 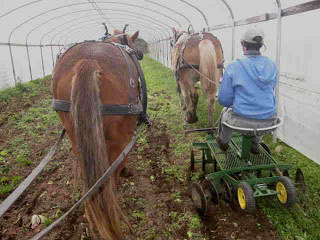 Snow doesn’t stop them, they are set to deliver their first CSA baskets to customers the third week in May! 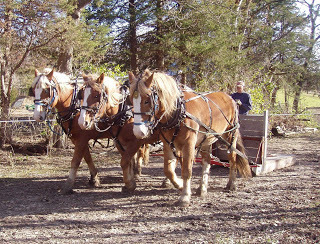 Misty and Duchess, the Equine Grand Dams of Therriault Creek Ranch, are in the center of the photo. From this prestigious vantage point in their pasture they monitor all human, animal, and plant activities undertaken on the ranch. A disproportionate amount of their time seems to be devoted to gazing dreamily at the carrot patch and hay meadow growth. What a welcome sight! One thing about N.W. Montana, only a bit of sunshine is needed to see the pastures ‘green up’. Therriault Pass is beyond the meadow and pastures. Finally! An opportunity Doc has been waiting for….the chance to get out and get some work done! What is the first thing he did? 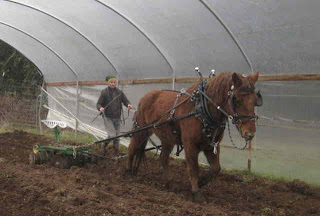 Hook Kate to a harrow. 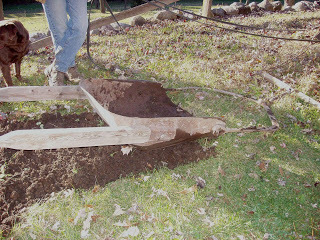 Tomorrow, Doc is working on getting that bigger harrow going….! Here is a video of Doc plowing snow in Montana with Belgian mares, Molly and Dolly.